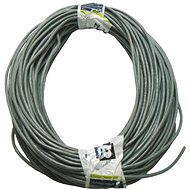 A UTP cable (twisted pair, wire) with 4 pairs, Cat 6 for GB networks, 75m. 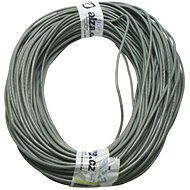 The wire is suitable for fixed wiring, e.g. in moulding or directly inside a wall. 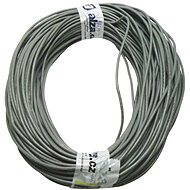 Compared to Litz wire, it fits better into terminal boxes and sockets, but it has worse mechanical properties. 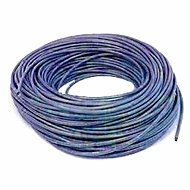 For shipping to other EU countries visit this page Datacom, wire, CAT6, UTP, 75m. Für Versand nach Deutschland, besuchen Sie bitte Datacom, Draht, CAT6 UTP, 75m. Chcete doručit zboží do Česka? Prohlédněte si Datacom drát, CAT6, UTP, 75m. Chcete doručiť tovar na Slovensko? 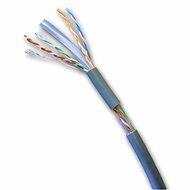 Prezrite si Datacom, drôt, CAT6, UTP, 75 m. Für Versand nach Österreich, besuchen Sie bitte Datacom, Draht, CAT6 UTP, 75m. Magyarországra történő kiszállításért tekintse meg ezt a termékoldalt: Datacom adatátviteli kábel, drót, CAT6, UTP, 75 m.